Today’s post is a follow-up to a previous post about a PSF funded project by Hyperion Development in South Africa. The PSF has recently heard from Riaz Moola about his latest project–working with Brothers For All to deliver Python courses in 42 prisons–including eight female corrections facilities–in the Western Cape. 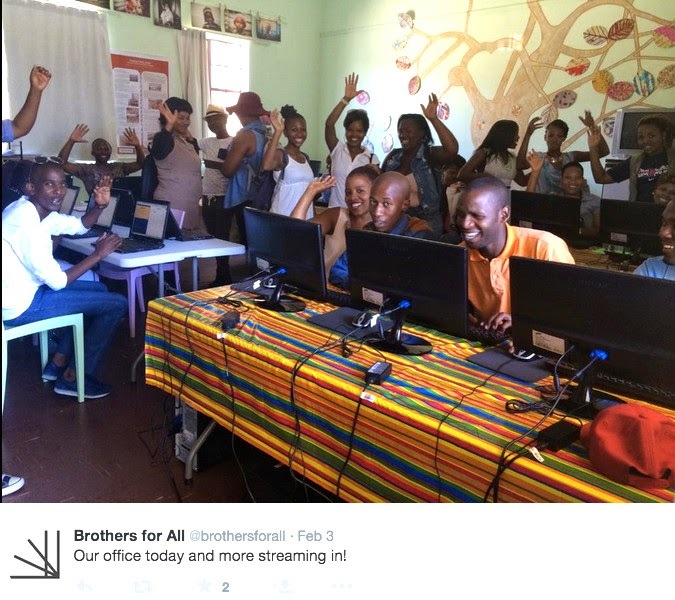 Brothers is run by an ex-con, Sihle Tshabalala, who taught himself to code online. When he got out of prison, he wanted to do something to slow the recidivism rate of South African ex-convicts. Not only does South Africa have the world’s eighth highest prison population, but the rate of re-offenders is over 80%. In addition, an extremely high unemployment rate of 25% adds to the hopelessness felt by those with prison records and without marketable skills. Brothers began last September by opening a center in a Western Cape township area. There, ex-cons and at-risk youth come to learn coding skills, entrepreneurship, and marketable crafts. They have recently been given approval by the provincial government to take the program into 42 prisons in the Western Cape. This way, prisoners can gain skills while incarcerated so that they are ready for employment immediately upon release. The ambitious scope of this program caused Brothers to partner up with Hyperion. While Brothers will focus on getting the programs into the prisons and more township areas, Hyperion will provide course content. Hyperion’s main concerns at this point are logistical and for long-term sustainability. As Riaz told the PSF, there are many challenges specific to South Africa; for example, for four hours every day there is a power blackout, which obviously poses a problem for internet connectivity. In addition, South Africa has the highest data costs of any country in the world. Travel for tutors and volunteers is also very expensive. And then, of course, there’s the poverty and its inevitable expression in crime. Sadly, one of the project’s computer labs was recently burglarized, resulting in the loss of equipment. But Brothers also has support streams, so they are currently receiving donations to make up for the loss. In future, they plan to purchase laptops, which can be more easily secured. Hyperion has been able to achieve a solid team of Python instructors. With the help of the PSF and other institutions, Hyperion is able to pay the travel and data costs for their volunteers. This has allowed them to be very selective; their instructors must pass tests of their technological and teamwork skills. Even so, Riaz tells us, they are never at a loss for instructor applicants. The Cape Town team, led by Hyperion manager Sobane Motlomelo (a Master’s degree student at University of Cape Town), will be primarily responsible for handling the prison project. Sobane's team has recently accepted four new members, and Riaz is confident of their ability. This is good news for Riaz, who began Hyperion as an experiment when he was an undergraduate, then saw it spiral into something very large, to which he has been giving all his time. Currently he’d like to step back just a bit. Our congratulations to him on being offered a Google internship! More info on this remarkable program can be found at its twitter page and htxt.africa. As you may recall, I previously posted about a wonderful project in South America that has been funded in part by the PSF. That first blog post described the Python events that Manuel Kaufmann had organized in Argentina and his plans to move on to Paraguay and then Bolivia. Please check it out at Python in Argentina. First of all, PyDay Asunción took place as scheduled on March 28th. This event was the culmination of Manuel’s efforts in creating the brand new Python Paraguay community. His Paraguayan adventure began by meeting with people from different Software Libre groups (PHP, OpenStreetMap, Sugar, Google Code In, etc) in an attempt to merge them into a new community focussed on Python. Their first meeting had 13 attendees who immediately began organizing for PyDay Asunción. This first PyDay (or mini-conference) in Paraguay was a great success. Over 100 people with varying levels of programming and Python skill attended. Manuel was pleased to report that among the presenters were a 17 year old boy and a young woman–clearly the diversity of our community is growing demographically as well as geographically. In addition, the importance of this event was marked by the Paraguayan government, who declared PyDay Asunción an official Technology and Cultural Event. Congratulations to Manuel and everyone who worked to make this a reality.You can read more about the day (in Spanish) at Manuel’s own blog post. Of course, as before, the momentum didn’t stop at one event. With a new community formed, new events were bound to occur. It always amazes me the way hard work and a good idea will grow. In fact, Manuel reported that some of the attendees of last month’s PyDay Formosa, Argentina were so enthused that they travelled 400 km to attend and help out at PyDay Paraguay. That kind of passion and commitment says a lot about the quality of these events and the desire for more. Perhaps Python is contagious! Similarly, Manuel tells us that a talk at PyDay Paraguay gave rise to another event: HACKÁra Asuka Guaraní : an event to translate the Sugar platform to Guaraní. This event was organized by Ricardo Saucedo and Martín Abente (one of the members of Python Paraguay). In fact, the idea of this event came out of Martin’s talk at PyDay Asunción. There were around 15 teenagers including 6 girls and a teacher who helped with the translation into their native language. According to Manuel, this potentially could lead to many people who don't speak Spanish being able to learn programming. Manuel has no intention of slowing down. Although his original plan was to spend three months on the project, he hasn’t yet made it to Bolivia, so he’s going to extend his time commitment. One problem he’s having is with his car. Apparently it needs quite a bit of TLC to keep it going. If you’d like to help with that, Manuel is accepting donations at Manuel’s Project. Since a little goes a long way to keep a car running, I hope you'll join me in giving him the cost of a latte or two. PyDay at Encarnación, Misiones, Paraguay on 30 May. In addition, Manuel has some exciting ideas for future projects, such as creating a Robot Course for kids, and bringing Facundo Batista (one of the best Argentinian Python hackers) to Asunción, Paraguay to develop a 3-days course. These are in the early planning stages, but if I know Manuel, I think we can look forward to hearing about their successful completion in the future. If you’d like to follow Manuel’s travel plans, or provide some support, please visit his website. As we previously announced, nominations for the Python Software Foundation's board of directors are open, and they will be accepted through Friday May 1. Please see our original announcement as well as details about the wiki here. Candidates for the 11 seats on the board are found at https://wiki.python.org/moin/PythonSoftwareFoundation/BoardCandidates2015. Those interested in running for one of the positions can add themselves, and per Section 5.14 of our bylaws, all candidates must disclose their affiliations. This year, as for the last bunch of years, I'll be the election administrator in the upcoming election. This will have some candidates for the Board of Directors of the PSF, and probably a few other issues like Sponsor Members approvals or membership resolutions. This year, as in past Board elections, I will use "approval voting" again. This will be explained again when you get ballots and announcements here. But the general idea is that each voter can cast as many Approve votes as they wish to for the 11 seats. A voter might vote for only the one candidate they really like to avoid diluting that vote. Or they might vote for every candidate except the one they really don't like as an "anyone but" vote. Or, in most cases, voters will vote for some number of candidates whom they feel generally comfortable with or prefer, and skip voting for any others. I give this preface to explain how I intend to vote. I am a white, male, middle-class, middle-aged, cis-gendered, American who has been on the Board for a long while. I may or may not run for it again (my name is on the wiki now with no candidate description, but mostly as a placeholder to get some permission issues sorted out for editing the wiki). But what I REALLY want is to have a PSF Board that is less American, less white, less male (and ideally represents diversity along other dimensions also: religious, sexual identities, linguistic, disability, etc). So I earnestly urge any or all PSF members, or their friends and colleagues, or other members of the Python community, or general supporters of Free Software, who might consider serving on the Board to place themselves in nomination, or allow themselves to be so placed. Serving on the Board is a genuine commitment of time and effort, and carries a fiduciary obligation. It's not just an item to put on a resume, and I don't want names of Directors from subaltern* groups there just as names alone. But I really do want those names as people who actively participate in making our community both more vigorous and more diverse. Which is to say, that for MY own vote, I can pledge to vote Approve to any candidate with a minimal indication of commitment to the selfless, volunteer tasks involved who doesn't look or sound quite so much like myself. Please, wonderful potential candidates, step up and let me cast these votes! [*] In critical theory and postcolonialism, subaltern is the social group who are socially, politically and geographically outside of the hegemonic power structure of the colony and of the colonial homeland. In describing "history told from below", the term subaltern derived from Antonio Gramsci's work on cultural hegemony, which identified the social groups who are excluded from a society's established structures for political representation, the means by which people have a voice in their society. If you want to edit a page and have just signed up, or you find that you can no longer edit a page that you could edit before, please write to the pydotorg-www mailing list, stating your account name and your intended edits and we'll add you to the EditorsGroup. Bear with us. We will continue balancing making the Wiki usable with also making it resistant to harmful changes by unregistered or malicious users. Our great thanks go out to Marc-André Lemburg and the PyDotOrg team who rescued an almost completely vandalized Wiki using imperfect backups, and heroic efforts, back in 2013. It’s that time of year again! The PSF annual election for its 2015 Board of Directors is currently seeking candidates. But what exactly, you may ask, does the PSF Board do? Well, it turns out that the fulfillment of the above-quoted mission statement requires that they do quite a bit. Basically, the directors manage all the business of the PSF. This includes appointing the PSF’s officers; holding and protecting Python’s intellectual property rights and licenses (the open source stack of licenses on the source code, all logos and trademarks); managing the budget and allocating funds; organizing and managing the annual PyCon North America (through the esteemed PyCon team); maintaining the PSF's legal status as a non-profit corporation (with all appropriate legal documents, such as articles of incorporation, bylaws, etc. ); managing and maintaining the python.org website and related resources; fundraising and obtaining sponsors; public relations; education and outreach; and membership management and services (and probably some other categories that I forgot). There are 11 total seats available; Directors are elected annually for a term of one year. Directors need not be residents of the US, and they are not compensated for their work. See PSF ByLaws for more complete info. If you or someone you know would like to run, i.e., do all of that extremely important work for free—although you will bask in glamor (glamour, if you’re British), glory, and gratitude, here’s the wiki for nominations: PSF Director Nominations. At the moment, no deadlines have been set; I will provide that info as soon as it’s available. Additional relevant info can be found at: PSF home page, PSF membership FAQ, and PSF members' wiki. Last week at PyCon, I had the pleasure of talking with Katie Cunningham at a dinner party hosted by O'Reilly. Katie is well-known in the Python community. The author of Python in 24 Hours, 2nd edition (Pearson 2013), Accessibility Handbook (O'Reilly 2012), and a video series Python Guide for the Total Beginner LiveLessons (Pearson 2013), she has also given talks and presentations at a number of conferences. Last year the PSF honored her with its Community Service Award in recognition for her work in founding and providing the Young Coders tutorial (along with co-recipient Barbara Shaurette). Imagine a room filled with pre-teens and teenagers eager to learn to code. Pretty daunting, huh? That’s the challenge Katie has taken on with Young Coders. This one-day tutorial covers basic Python by starting with simple concepts and then building up. Using Raspberry Pis, Katie says, helps to “demystify the computer,” and by the end of the day, students are doing fairly complex work with loops, and reading others' code. Last week at PyCon Montreal, 41 students attended one of the classes. You can check out Katie and Barbara’s 2014 PyCon talk about Young Coders. As we conversed about Python, teaching, and writing, I observed first-hand those qualities that make Katie an effective teacher—passion, clarity, perceptiveness, wit, and humor. With a degree in Psychology, she “stumbled into technology” and found that it paid well. “It’s hard to say ‘no’ to money when the alternative is to get an MA degree and make $40K,” she explained. But I believe that Katie is a natural teacher, so I’m not surprised that once in tech—she’s worked for NASA and Cox Media—she pioneered ways of making it more accessible to others and easier to learn. Her current professional position combines her technological prowess and her pedagogical talents as Senior Applications Developer and Director of Technology at Speak Agent, a provider of customized interactive content for language teachers. Some of Katie’s teaching philosophy and techniques come from her experience as a mother. She told me that her kids had access to their own computers at the age of three, in large part because she wanted them to stay away from her computer. The result is that her kids are very fluent—if you give them a computer, they can figure out immediately what to do with it. It’s not, according to Katie, that her seven year old daughter is so smart; rather she’s had four years of informal training. But of course many kids don’t have that advantage—they’ve grown up in homes where there was no computer, or maybe only one, but it was too precious to allow the kids to use it. Katie wants to be able to formalize the informal training—to teach kids such basic ideas as how to generally find something on the computer, or the differences between an email application, a web browser, and the internet (some kids, and even adults, confuse them). So Katie finds that using concrete metaphors and teaching basic vocabulary are extremely important in getting kids to understand coding. For example, Katie teaches the logic of and/or by reference to pet stores; in Virginia, in order to buy a fish, a person needs to be at least 18 years old, AND have money to pay for it, AND promise to put it in an aquarium and not into the river (apparently, this was a problem)—all of these conditions must be true. But when paying, you can use cash OR credit OR a data card OR a gift card. She says that her students respond well to these kinds of examples. Teaching this way is not only effective, but it “brings the humanity back into tech”—it shows that these are things that humans do, rather than abstract relations between a person and a machine. In the future, Katie would like to teach coding to younger children. Since the Young Coders track is restricted to ages 12 and older, Katie sees this as a real need. We have younger kids coming to PyCon, as more attendees bring their kids and want a class for them. But putting very young kids in a class with older learners doesn’t work well. Their needs and learning styles are quite different. For example, five year olds don’t have the physical control or dexterity to type or to sit still for long. Katie would like to develop a teaching track that is “more kinetic.” Basic concepts, like the logic of if/elif/else could be taught by having the kids get in one line IF their shirt is red, ELSE IF green, get in another; or ELSE, yet another. [It] … not only teaches the student how to program, but teaches the mentor how to teach. Through carefully laid and interactive chapters, the student is guided not only through the basics of programming, but all the way up to game development and creating websites. At the same time, the mentor is coached in how to help their student solve problems, warned about where students often have trouble, and explains why lessons are structured in a certain way” (see LinkedIn). The book sounds like a wonderful tool for teachers and learners (of all ages) and I’m looking forward to reading it. Thank you Katie, for sharing your expertise and insight with the rest of us. Your work is a huge part of what makes the Python community a living, growing, exciting, and powerful entity of awesomeness. Python X Southwest: SciPy in Austin! 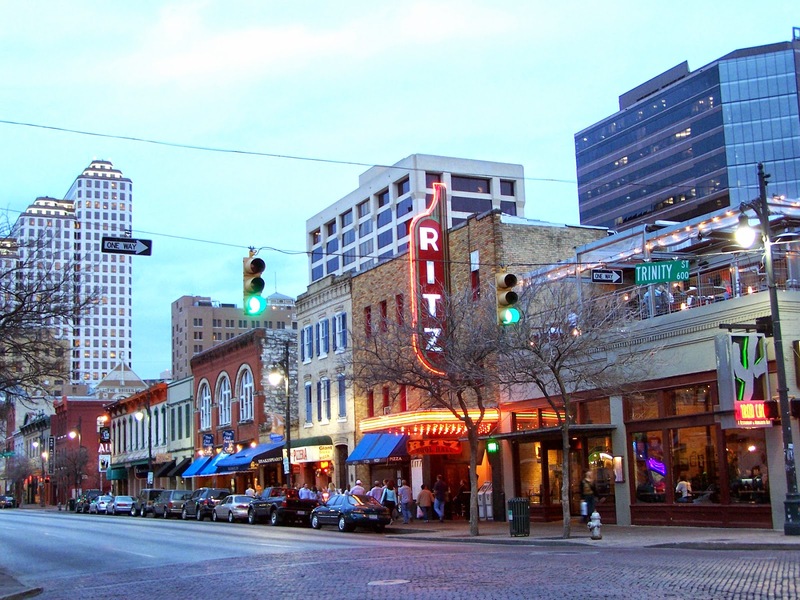 Mark your calendars: SciPy 2015 is coming in July (July 6-12, 2015) to the fabulous city of Austin, TX. This will be the 14th annual SciPy devoted to scientific computing with Python, and organizers expect to exceed 500 attendees again this year. The importance of this conference for scientific computing cannot be overstated. Enthought, SciPy’s institutional sponsor, has been joined by many others, including Microsoft Azure, Square Root, D E Shaw & Co, Kitware, PyLadies, and, of course, the PSF. The PSF, which has funded SciPy in the past, is sponsoring the conference this year at the Silver Level with a contribution of $3000. Last year’s SciPy saw sponsorship increase 85% over 2013, a clear indication that this conference is growing in size, importance, and reach, as is the use of Python as the premiere language for scientific computing! Chris Wiggins, Chief Data Scientist; Associate Professor of Applied Mathematics, The New York Times & Columbia University. SciPy 2015 will also include two specialized tracks that run parallel to the general conference: Python in Data Science and Quantitative Finance and Computational Social Sciences. The venue is the same as last year’s; the AT&T Executive Education and Conference Center at the University of Texas campus in Austin (AT&T). This location is central and allows easy access to Austin’s terrific attractions; good food, music, and dancing (6th Street is the place to go, and don’t forget to eat barbecue and wear some cowboy boots!). The full schedule of talks and speakers will be posted to the SciPy website later this month (SciPy2015). PSF supports more Django Girls! A couple of posts ago, I wrote about the PSF’s funding of the upcoming Plone Conference in Bucharest as an example of how the PSF supports Python development for the web (see Plone). Another web framework the PSF has been supporting is, of course, Django, and with the upsurge of Django Girls activities, support for Django Girls simultaneously allows the PSF to make progress on its commitment to diversity. $600 to Django Girls Mbarara on April 18th. 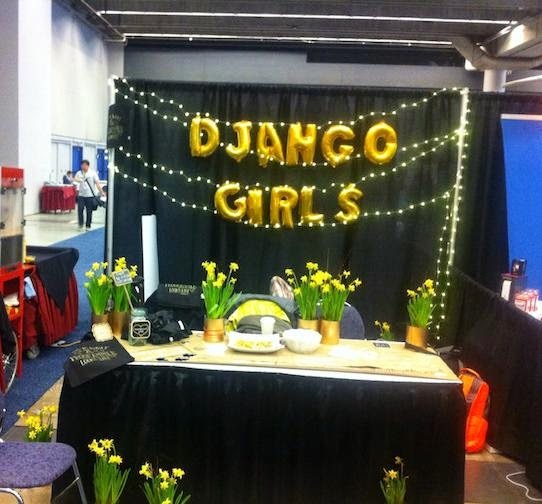 Django girls Booth at PyCon. By providing free one-day workshops, Django Girls has had great success in bringing woman into programming and tech. Their workshops take participants through a tutorial that uses HTML, Django, Python, and CSS, allowing each participant to build her own website by the end of the day. We believe that IT industry will benefit greatly from bringing more women into technology. We want to give you an opportunity to learn how to program and become one of us - female programmers! Django Girls' commitment to teaching programming extends beyond the workshops they provide to teaching resources that can be used by others–either for their own learning or to conduct and organize other workshops. These resources include the tutorial they use for their free one-day workshop, an organizers' guide, coaching manual, and tutorial extensions. All their resources are freely available at Django Girls. See the Django Girls blog for success stories of individual women who have benefitted from their workshops at Django Blog. As was pointed out by Jacob Kaplan-Moss' wonderful keynote at PyCon 2015, it is predicted that by 2020, there will be a shortage of about 1.5 million qualified tech workers to fill industry demand. So the need to recruit women and other under represented peoples into tech is urgent. And, of course, it is also an opportunity to further spread the use and culture of Python, open source, and free software. Our hats are off to Django Girls for being a major force toward that end. After having distributed the first 5,000 copies of the PSF Python Brochure to Python conferences and user groups around the world in the last 12 months, we have now finished the second print run with another 5,000 copies just in time for PyCon 2015 in Montreal. Many thanks go to JetBrains for jumping in as additional ad sponsor to help finance the printing and community order shipping costs for this second print run. We would also like to thank all our initial sponsors and contributors for their hard work. The feedback we have received for the brochure was positive all around. Come and get your copy at the Python Software Foundation booth (booth number 101) at PyCon 2015 in Montreal. Jan Ulrich Hasecke who was responsible as editor in chief and managed the contribution side of things together with me. Armin Stroß-Radschinski and his company evenios which did the initial coordination of funding, layout concept, artwork, production and distribution. Our efforts have resulted in a brochure of almost fully CC-3.0-BY-SA content that is reusable by the community. The feedback after one year of circulation is quite promising and we are considering doing a second volume with more success stories and use cases, provided we can get enough support from sponsors and the PSF. The PSF is looking to fill a position as an Event Coordinator/Administrator. Note that this is a remote position and that it does not require software development or Python coding skills. It is open to anyone who wishes to work for the PSF and has the relevant project management skills. Manage/assist with short term projects when needed. Work onsite once a year, and perhaps perform a site visit once every two years. Assist with post­-event wrap up. If interested, please contact Ewa Jodlowska at: ewa@python.org. PSF to sponsor Plone Bucharest 2015! The PSF has been happy to acknowledge and help sponsor the use of Python in creating terrific Web Development Frameworks. This blog has previously featured several instances of PSF involvement in Django-related events (see e.g., CSA Award to Django Girls). There have also been major developments in the world of Plone. For those of you who don’t know, Plone is an open source Content Management System, written primarily in Python. It was developed in 1999 by Alexander Limi, Alan Runyan, and Vidar Andersen, atop the open source Python-based Zope application server. Its license is held by the non-profit Plone Foundation. Plone is positioned as an Enterprise CMS and is most commonly used for intranets and as part of the web presence of large organizations. High-profile public sector users include the U.S. Federal Bureau of Investigation, Brazilian Government, United Nations, City of Bern (Switzerland), New South Wales Government (Australia), and European Environment Agency. Plone’s website highlights its size and scope ("340 core developers and more than 300 solution providers in 57 countries… "), versatility ("available for all major operating systems… and in more than 40 languages"), and security track record ("the best … of any major CMS"). See Plone website. This year, the 13th annual Plone conference will be held in Bucharest, Romania, October 12 - 18. It will mark Romania’s first major Python event, and the PSF is proud to be a sponsor at the Silver Level, with a grant of $2000 USD. Check it out at Plone Bucharest. The conference website also calls attention to Bucharest’s eclectic burst of metropolitan and intellectual ambition, and its many attractions, ecstatic night-life, and immersive underground culture. 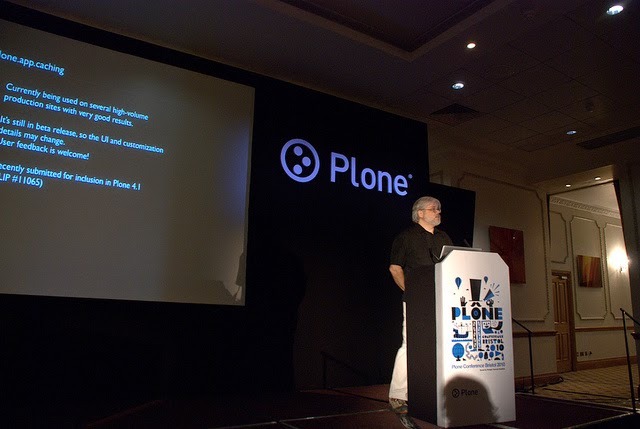 In addition to its successful conferences (last year’s conference, held in Bristol, UK, featured 42 talks in 3 rooms over 2 days), the Plone community is well-known as a pioneer in the use of sprints for open source development. October’s conference will hold Plone’s largest annual sprint at the conference site, immediately following the 2 days of scheduled talks. Plone Bucharest certainly sounds like an exciting place to be in October! PyCon 2018-2019 in Havana, Cuba! The below post is an April Fools joke. It was written by PSF Blogger and Basic Member Mary Ann Sushinsky, with Director and Outreach & Education Chair David Mertz, to encourage, in a tongue-in-cheek way, more international cooperation in the Python world. It did this by poking fun at how the governments of various countries have hindered events like a hypothetical PyCon Cuba from happening. It touched on a political area where sensitivities are often high, and a number of people were hurt or offended by the post. That wasn't cool of us, and we apologize. The post remains below because we believe in acknowledging our error rather than just deleting it and pretending that it didn't happen. One positive thing that came out of this was a better understanding by many of us about what many people from Cuba have gone through, and it has strengthened our resolve to find ways to do good by them. We very much hope better to aid Cubans in coming to future Python events throughout the world, and are saddened to learn of financial and visa obstacles they have faced in the past and still. Moreover, discussion following this post makes us hopeful that a "PyCon Cuba" (under some name) may be a realistic possibility in the not-too-distant-future, an event the PSF would love to help create. With recent easing of travel restrictions from the United States, the possibility of going to Cuba was immediately embraced by the PSF and PyCon organizers. At last, we would be able to bring the joy and power of the Python community and coding skills to a nation that already has a deep understanding of the values of collaboration over competition, of community over individual achievement, of free and open availability of knowledge over corporate owned intellectual property. Not to mention its beautiful climate, palm trees, beaches, good food, music, and dancing. Lo práctico gana a la pureza. Los errores nunca deberían dejarse pasar silenciosamente. A menos que hayan sido silenciados explícitamente. Frente a la ambigüedad, rechaza la tentación de adivinar. I’ve always stood for the core American principles of Free Enterprise, Free Software, and a Free Republic. It heartens me to see the largest conference about my favorite programming language held both in the nation of my birth, and now in the one where my father was born. 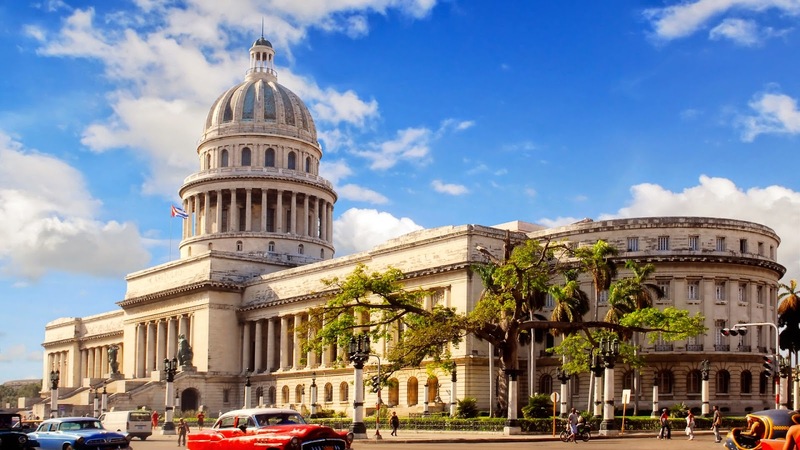 Havana is not new to hosting conferences—in fact many international organizations convene at such venues as the International Conference Center, the Catholic University of America, and the University of Havana. Looking forward to seeing you in Cuba in 2018. ¡Sí se puede!